Penn State recently invested in an upgrade to its portion of the data grid that will roughly quadruple the cluster's capacity for conducting cutting-edge astronomy and astrophysics research. The new cluster, 192 servers working in tandem, is administered by the Institute for CyberScience (ICS). Bangalore Sathyaprakash, professor of astronomy and astrophysics and Elsbach Professor of Physics; and Chad Hanna, associate professor of physics and astronomy and astrophysics, and ICS co-hired faculty member, are the primary researchers who will be using the new system with their research team and collaborators. "At Penn State we're involved in all aspects of gravitational wave astronomy, which we use to learn about the universe," said Sathyaprakash. "Until the discovery of gravitational waves, the only way we could observe the universe was using light, radio waves or gamma rays, which all belong to the electromagnetic spectrum. Gravitational waves allow us to create a complementary picture of the universe and reveal processes and phenomena that might not otherwise be revealed through electromagnetic observation." The new cluster will vastly increase the speed at which researchers can complete analysis, according to Chad Hanna. He and colleagues recently finished the first study that used data housed on Penn State's LIGO cluster. The team designed an experiment to quantify the number of binary black holes in the universe that have less mass than the Sun, which may have implications for the amount of dark matter in the universe. "Our first study that solely used the Penn State LIGO cluster took 12 weeks," said Hanna. "If we were to complete that same investigation on the upgraded cluster today, it would only take three weeks." "I'm most excited about the extra machines," said Ryan Magee, graduate student in physics. "It allows for multiple analyses to run at once without much bottlenecking." Magee plans to use the cluster to search for sub-solar mass compact objects in the universe, he said, because "they are not produced by stellar mechanisms, so it would be a hint of new physics." "During that summer camp I was actually afforded the opportunity to visit the cluster, and I remember thinking it was really cool and fascinating to see the other side of the computer," said McClincy, now a member of Hanna's research team. "I've always thought tech like this is amazing, so I can't wait to see what can be done now that it will be even more advanced." The first iteration of LIGO's observatories collected data from 2002 to 2010 but did not detect any gravitational waves. Upgrading the observatories to their current state, known as Advanced LIGO, greatly increased their detection capabilities, and, as a result, the system has detected six gravitational wave events since 2016. 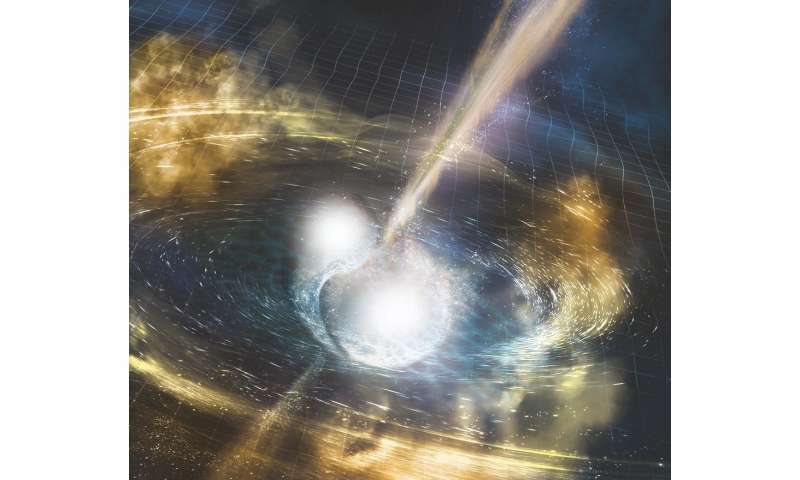 "When advanced LIGO reaches its design sensitivity, we will observe binary black hole collisions as far as tens of billions of light years and binary neutron star mergers billions of light years away. With the construction in the 2030s of new detectors that are 10 times more sensitive than the current ones, we will be able to observe the entire universe in gravitational waves for black holes and most of the universe for neutron stars," he said. "With advanced LIGO we expect to observe one event every day or every other day, this will offer a huge computational challenge, and so every bit helps," he said. "With this new LIGO cluster, what we've done is to secure enough resources to be completely independent in doing our analyses. ICS and Penn State are enabling this challenging science. Without this new cluster, we would be very severely hampered from doing the science that we want to do." Good, they're making upgrades to the processing as well as the detecting. As the detectors increase in sensitivity, the data rate will rise quickly. Hopefully they will continue upgrading. We need these results quickly enough to engage the traditional EM astrophysics community quickly, as we saw in GW170817. And there's also eLISA to think of. OK, now we've got more psychotic ideation. This one thinks scientists spend billions of dollars on sensors and computing time in order to dis its jebus. I see no point in responding to the conspiracy theories of psychotics. Bye now. Mute button engaged. You use a computer and the internet to get your message out?